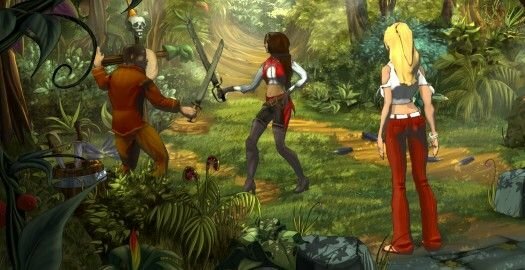 Last year’s PC adventure So Blonde told the story of a spoiled 17-year-old girl named Sunny who, after accidentally traveling back in time and being shipwrecked on a mysterious island, had to learn to take care of herself and even save the day. In the end, she did a pretty good job; well enough to be nominated for three Aggie awards, including Best Writing in a Comedy and even Best Third-Person PC Adventure. Around the time of its release, German publisher dtp and French developer Wizarbox announced they would also be bringing an alternate version of the game to the Nintendo Wii and DS. This isn’t a quick-and-dirty port, nor is it exactly a sequel, but a re-imagining—a “what if”—of the same basic concept. At this year’s E3, I had the chance to talk about the project with Wizarbox CEO Fabien Bihour, and even play the DS version for myself. In the original game, Sunny Blonde wakes up after a bad storm on the beach of Forgotten Island, and soon learns the place is ruled over by the cruel and tyrannical pirate One-Eye, who’s made the people his slaves. In the new Wii/DS So Blonde (with a subtitle to be announced soon to minimize confusion), Sunny still washes ashore on Forgotten Island, but on the opposite side, causing her to meet One-Eye much sooner and get his side of the story. This simple change in the premise has many repercussions, causing the storyline to play out very differently. Fortunately for fans of the original, writer/designer Steve Ince has returned to pen the new script as well. Though the Wii edition of So Blonde wasn’t available for display, I did manage to get some hands-on time with the DS version, and was assured by Bihour that they are—except for the toned-down graphics and lack of voice acting on the DS—essentially identical. The first thing I can tell you is that it looks great, and not just “for a DS game.” The backgrounds are incredibly detailed and colorful—almost too detailed for the size of the screen, though thankfully pressing the Start button will highlight each hotspot with a subtle twinkle to help the player along. Each screen also contains nicely animated details, like crashing waves, flickering campfires, and swirling chimney smoke. When a character speaks, including Sunny’s narration, a well-drawn character profile pops up, changing its expression regularly. The stylus controls will probably take some players a bit of getting used to, but it’s fundamentally the same point-and-click controls from its PC predecessor. You tap an area on the bottom screen to make Sunny walk there, and the farther away from her you tap, the faster she’ll move. When you tap a hotspot, a sub-menu of interaction choices displays (i.e. look, take, etc.). Your inventory is displayed along with other options on the top screen, which can be called down to further interact with by tapping the pull-down bar along the edge of the touchscreen. Even with the slight learning curve, within a few minutes I was locating lost handbags and creating crude makeup mirrors with the best of them. The developers are aware that, while a lot of people enjoyed So Blonde on the PC, there were places that could be improved, and they’ve implemented some of these enhancements in the new game. For one thing, Bihour claims there will be no more long load times in either the Wii or DS version of the game. They’ve also added a Quest Book to keep track of what Sunny needs to tackle next, and bringing up Sunny’s map of the island now allows the player to fast travel between major locations. If you’re a fan of the PC voice actors, Wizarbox hopes to bring the same actors back for the Wii, but those deals haven’t been finalized yet. We’ll find out for sure when So Blonde washes up in Europe this holiday season, hopefully with an English language version in tow. So Blonde has been the only adventure to make a significant impact on me since Still Life so I’m looking forward to this re-imagining. I hope the puzzles are a significant improvement on this installment. Even I couldn’t defend the puzzles in the original.